Actually, my fall gardening tip it is more of a plea. In many areas of the country, fall is the time to grow cool season crops such as cabbage, kale, radish, broccoli, collards, and others. All these plants have something in common. 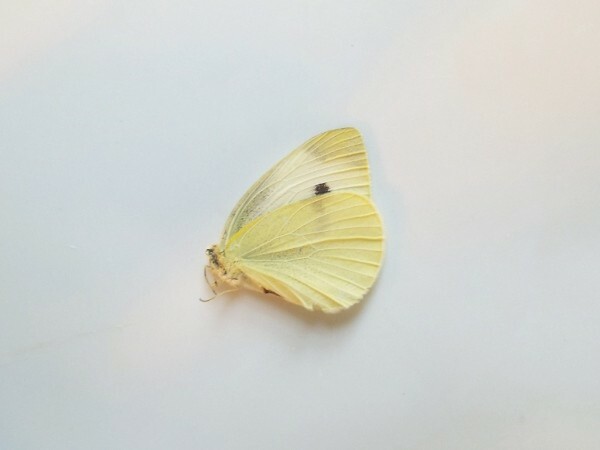 They all are host to the cabbage butterfly, Pireis rapae. While I couldn't get any official figures, the annual damage done by the caterpillar of this butterfly is said to be well into the hundreds of thousands of dollars. In the home garden, these butterflies can be kept under control with the use of chemicals. This is an after the fact approach and certainly not a good idea. You will still have some damage and you will have subjected your vegetables and the environment to unnecessary poisons. Row covers, on the other hand, if used properly, can prevent damage done by this insect, not just stop it after it has started. The row covers also have the advantage of allowing you to extend the growing season a bit due to their ability to maintain an ambient temperature around four degrees higher than without the cover. Now, for my plea. 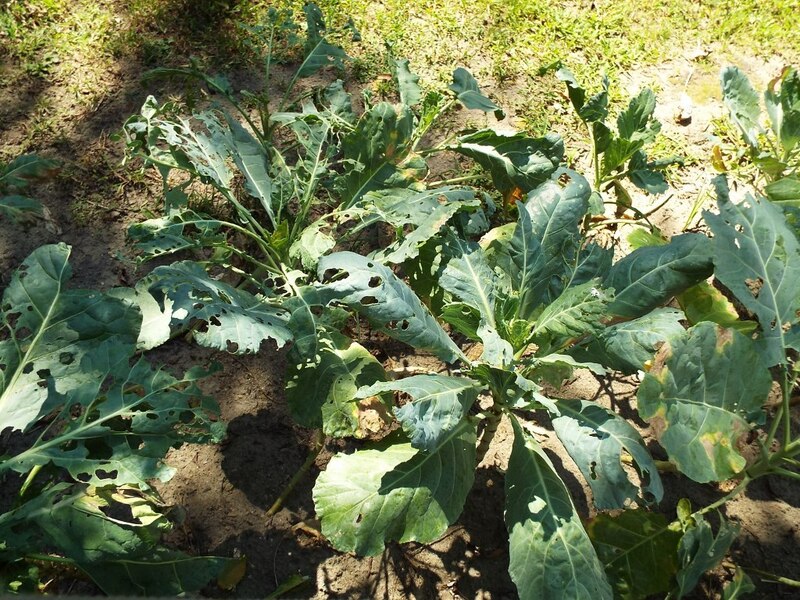 If you plan to grow these plants that are host to the cabbage butterfly, please do so responsibly. That means taking every precaution against the proliferation of this insect in your garden. 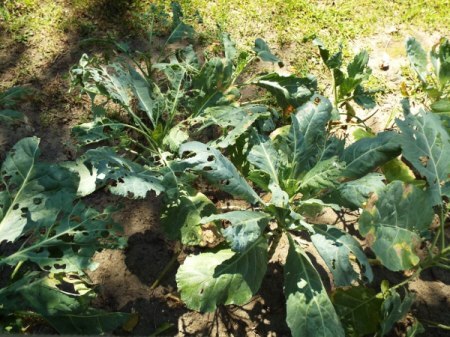 In a nutshell, if you grow these host plants and do nothing to prevent your vegetables from being a nursery for the cabbage butterfly, you are, whether you realize it or not, doing an injustice to all fellow gardeners. This pest was introduced into the Americas around 1860. Our farmers have been fighting it ever since, while suffering millions of dollars in crop damage. The insect is rampant, today. Please, if you grow vegetables host to this butterfly, do your part to keep it out of your garden, or just don't grow those vegetables. Pictured are collards being grown by a neighbor. He was very diligent in that he carefully examined these plants twice a day, every day. He has excellent eyesight and picked every caterpillar he saw from the plants. You can see the results for yourself. All this damage could have been prevented with row covers and that time spent picking caterpillars could have been spent doing something more enjoyable. I should have made a notation. The butterfly I photographed is the male. The female looks almost identical except she is white. Since writing this article, I have found that most bird netting has holes small enough to keep this insect out. It is cheaper than row covers and will last many times longer. The only disadvantage is that it does nothing to help extend the growing season. I grow broccoli just for the cabbage whites, the problem is the little white gnats that cover it.